Well, I have to admit, I liked that description of how I stir up trouble. So just think of this quick chew-your-smoothie salad as a tasty croquet ball. It’s not that I am going to preach the no smoothies sermon. 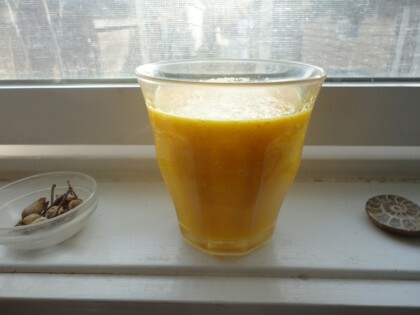 In fact I got the idea for this simple little salad when I had the flu and saw this Naked Turmeric Tonic drink from Naked Magazine. Orange food cheers and warms me up when I am sick or low, so I decided to make it. There’s just one problem: there’s no high speed blender in my kitchen to whir this up into a creamy orange drink. And beyond thatthere’s a bigger glitch: I’d rather chew my food. I have to be pretty sick to want to drink it instead. Long long before Dr. Esselstyn and others began to say it’s better to chew the food we eat, little old foodie me had figured out that if I drank my breakfast I felt robbed of the pleasure of chewing. And I was often still hungry. So I’ve long thought it was in my best interest to make sure I got to chomp on most everything I consume in a day. You may call a goat. I am, after all, a Capricorn. Or a horse. The chewing profile of both animals suits me nicely and I have the astrological chart to prove it. When I was sick I chose a middle path. I whirred the ingredients for the naked turmeric tonic up in my regular blender on “chop” or “grate.” This gave me sort of vegetable-fruit-turmeric “frosty” I could eat-slurp with a spoon that still had little tiny pieces of carrot and orange pulp to chew on, which I considered the best of both worlds. I sprinkled the top with cinnamon and ginger, and drizzled a little lemon or lime juice over it. But once the fever was over and I was well on the mend, I couldn’t resist adding some greens, onion, and bell pepper and making this into a little salad. Just to see. And to chew. If you like to waltz through your breakfast each morning with a smoothie as all or part of it, well, you have my blessing. Just step over this little “croquet ball” of a salad and keep right on with your splendid Vitamix. But if you’d also like to chew the ingredients of this turmeric tonic along with some greens, then give this little sweet-tart-crunchy easy salad a try. Tear a couple of fistfuls of baby spinach into a salad bowl. Drizzle with lemon juice and sprinkle with cinnamon. 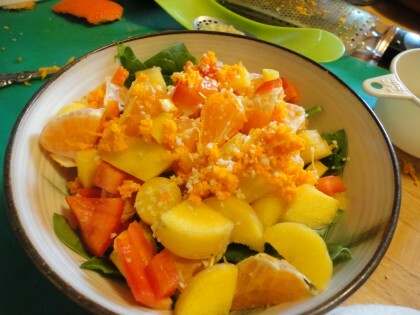 Top with chopped carrot, tangerine, the grated turmeric and some green onion. Sprinkle with a little more cinnamon, ginger and lemon juice. Chew to your heart’s content. Notes: Fresh turmeric root can be hard to find. I’m enjoying it while supplies last up here in the wild north. If you’re lucky enough to come across it where you live, it’s very easy to grate and the taste is milder than than it is in powdered form. And very pretty indeed. Either way you take this tonic, it’s a big help when you’re feeling congested, achy or just plain under the weather. Thanks to the folks at Naked Magazine. I raise my glass–and also my fork–to however you decide to try it. Happy waltzing through the options. This is right up my alley. I was sipping my salads long before I even knew what a smoothie was and I’m always looking for new & fun ways to use Turmeric. Thanks for this and all your ideas. Let those crochet balls fly! Love pretty bowls too. Another great piece of inspiration from you Maria. Thank you. I love smoothies, but I prefer them as refreshing snacks than as meals. I, too, derive most satisfaction from sitting down to a plate of food that I can chew, and I also really love varied textures. Breakfast salads are great, but I don’t make them often enough — you just inspired me! Agree with Gena. Smoothies are great for pick up snacks not so much as meal replacements. But that’s just me. Hi Veronica–well, I love your description of how I “stir up” trouble. . .and I guess I need to clarify here for you and Gena that I actually ate this salad at lunchtime. But I DO eat a kale breakfast salad with quinoa nearly every darn morning. And I wouldn’t be opposed to eating this one for breakfast. 🙂 Cinnamon and spinach are gold together. I learned that from Lorna Sass’s old book Short Cut Vegetarian. She has a spinach lentil ragout in there that uses orange juice and zest and cinnamon as flavorings. Heaven!